The pin established with the first move means the Knight can’t be taken. This is a very old composition, by the Syrian Phillip Stamma, first published in his “Essai sur le jeu des echecs”, 1737! Later translated into English as “The Noble Game of Chess”. A bit of drama with a Queen sacrifice, but mate is then unavoidable. So to this week’s puzzle – quite a good one, if I say so myself. White has just played Rh2-h3 with the plan Rg3 followed by Bxh6. Why was that a bad idea? Black to move and win! Same as usual – solutions in the comments please! Good luck! 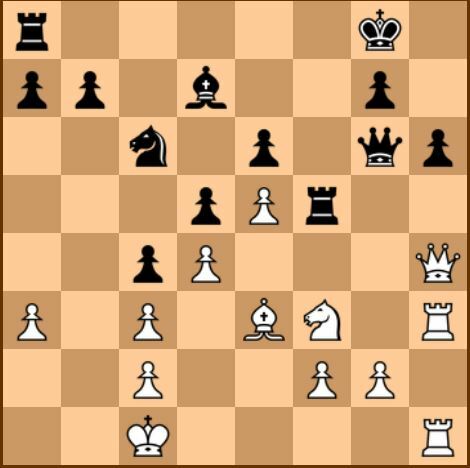 Very nice John, with the knight of course being the only piece that could have defended the c2 square. I think the only way white can stop black landing the mating net is Rg3 which costs him a piece.